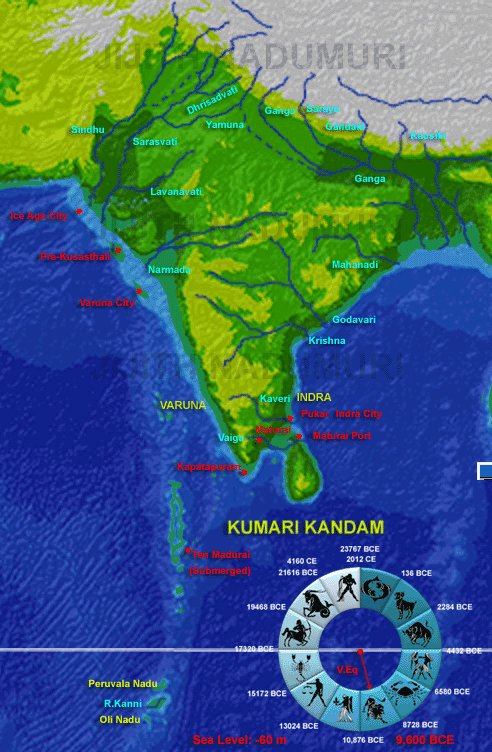 In this section we try to analyze how Kumari Kandam submerged step by step following the rise in the sea level after the Last Glacial Maximum (LGM) occurred around 19,500 BCE. We also try to correlate the change in the coast lines with what we know from Tamil and Sanskrit texts discussing about Kumari Kandam and other connected landmasses around Indian coast-line. 16,000 BCE:- The sea level rose from - 130 meters to -120 meters (10 meters in the 3500 years since 19,500 BCE). The Central Indian Ridge (CIR) - Sumatra - Diffuse plate boundary of Indian plate falls through Kumari Kandam. It is a region with anomalous seismic activity and is part of the Chagos Anomalous Seismicity Region. Due to this inter-plate deformation, the surface elevation in Kumari Kandam region dropped. As a result to the combined effect of the sea level rise and the surface elevation fall, Kumari Kandam started submerging. A narrow bridge like stretch of land connected the northern parts (now part of the shallow shelf of sea near Kanyakumari) of Kumari Kandam to the southern parts (now Maldives). 14,000 BCE:- Due to the combined effect of sea level rise and surface elevation drop more parts of Kumari Kandam submerged leaving many islands. Ten-Madurai city probably survived as an island. By 14,000 BCE, the sea level again rose 10 meters (-120 m to -110 m, in 2000 years). We cannot rule out floods, because sea-level rise was never gradual. It contained occasional sudden rise and gradual rise at other times. The narrow bridge like stretch of land connecting the northern parts of Kumari Kandam to the southern parts has now disintegrated into many islands. Only a maritime culture with good navy, trade boats and passenger ships can now manage Kumari Kandam which has now reduced to many islands. The Pandyas fit the description very well since they were a great maritime power in recorded history as well. 9,600 BCE:- The southern stretch of Kumari Kandam is all gone. Ten-madurai city is now submerged. Kapatapuram / Kavaata is the new cultural center of Kumari Kandam which exist to the southern tip of what is left of Kumari Kandam. Sea level is now at -60 meters. In 4500 years since 14,000 BCE, sea level rose by 50 meters with two major rises interspersed with gradual rise. In 9,600 BCE Maldives looked like a chain - a chain-like landmass almost continuous except with a few bays and river-lets. Probably somebody watched it from the sky and gave the name Maala-Dvipa, the island that look like a chain. This can be added to the growing evidence on the ancient Vimanas, that could fly like an airplane. An interesting point worth noting is that the name Kavaata and the name Dvaraka (of Mahabharata fame, in Gujarat coast) both means 'gateway'. Dvaraka served as the 'gateway' to the submerged lands to the south of Gujarat. Kavatapura served as the gateway' to the submerged Kumari Kandam to the south of it. Inversely for those refuges who came from the southern lands, Dvaraka and Kavatapuram served as the gateway to the safe mainland, which is not submerged yet. Almost half of the continental shelf of western shore of India is now submerged. Varuna city region and Kusasthali region became islands. In the Improved Bathymetry Study of Indian Ocean, the size of the Varuna island varies and is non existent based on some parameter changes. However large islands of the size like the one found in Graham Hancock's book, Underworld is ruled out in the new study and is considered as an anomaly or error in previous bathymetric studies of this region such as those done by Glenn Milne. 5,500 BCE:- Kumari Kandam is submerged except a few islands near Kanyakumari, identifiable with Mainaka and other islands and mountains described in Ramayana as lying between India and Lanka. Sea was around 5 km away from what is now Kanyakumari. So a small portion (2%) of what was Kumari Kandam existed to the south of Kanyakumari. Probably the city Manavoor (new cultural center for people of Kumari Kandam) lied in this land 5 or 4 km to the south of Kanyakumari. Kapatapuram is now submerged along with Ten-madurai. Sea level is now at -10 meters. In 4000 years since 9,500 BCE, sea level rose by 50 meters. Other interesting features include a 20 km wide and 100 km long land bridge that still connected India and Lanka. The island of Kusasthali which would later be known as Dvaraka is seen in the south western shore of Gujarat. The India-Lanka land bridge is the remnant of the much wider landmass that completely encompassed Lanka. Soon this land bridge too will submerge. In 5077 BCE when Rama (born in 5114 BCE) reached here from Ayodhya, after traversing Chitrakuta, Panchavati and Kishkindha there was no land bridge. It submerged taking 100 to 300 years in 5400 BCE or in 5200 BCE. Hence Rama had to construct an artificial bridge to cross the ocean and reach Lanka to reach the city of Ravana (See:- Valmiki Ramayana). Kusasthali-Dvaraka island is what remain of the vast plain that existed during the end of last Ice Age to the west of western ghats. In 5500 BCE the Kusasthali Island was around twice larger (100 km long and 50 km wide) than the Dvaraka island (50 km wide and 30 km wide) that existed around 3200 BCE when Krishna founded his city there. In 3102 BCE Dvaraka Island too submerged. The establishment of Madurai city in Vaigai river in the south proceeded after Kapatapuram submerged in 5500 BCE. This was done probably in 5300 BCE. A city of similar name, viz. Mathura was established around the same time. Raama's brother Satrughna took that city from a Yadava king named Madhu in around 5050 BCE (when Rama was around 60 years old) . The Yadavas and the inhabitants of Kumari Kandam had long standing connections. The Paandyas lived in Krishna's Dvaraka and in Yadava territories like Anarta (Gujarat mainland) probably as refuges from the Kumari Kandam which submerged in stages. The Pandya king Sarangadhwaja was an enemy turned ally of Krishna and took part in Kurukshetra War on behalf of the Pandavas at the behest of Krishna as per the Sanskrit epic Mahabharata. A section of Yadavas, after the submergence of Dvaraka in 3100 BCE are mentioned as living in Paandya kingdom centered around Madurai, after migrating from Dvaraka, as per many Tamil texts. Thus the role of Pandyas of Kumari Kandam in the establishment of the city of Mathura in the north cannot be ruled out. In Silappatikaram, Kaadu Kaan Kaati (17-22) we have the following narration:- The Paandya King, having lost Kumari of many hills and the river Pakruli, conquered the Ganges and the Himalayan regions in the North and ruled them from the South. (Paavanar's commentry). The city of Mathura could be the result of Pandya presence in the Ganga region which they later gave to their cousins viz. the Yadavas. The Yadava-Pandya kinship seems to have established through generations of marriage relationships. Both the southern city Madurai and its northern cousin Mathura is based on the name Mathu (Madhu). Madhu was a Yadava king and the founder of the Madhava branch of the Yadava dynasty in which Krishna was born, as per Mahabharata. The Ikshwakus like Satrughna (brother of Rama) considered them as enemies and tagged them as 'Rakshasa'. Hence in Ramayana Madhu is known as a Rakshasa and was slain by Satrughna. 3,100 BCE:- In 2400 years since 5,500 BCE, sea level rose by 6 meters from -10 m to -4 m, not a significant rise. The island of Kusasthali is reduced in size and is now Krishna's Dvaraka. This island is about to submerge in 3100 BCE due to inter-plate deformation in that region of the Indian plate as it undergoes minor movements with respect to the nearby Arabian plate. The Kusasthali-Dvaraka island submerged in 3100 BCE due to inter-plate deformation of the Indian plate as it undergoes minor deformation causing movements with respect to the nearby Arabian plate in the west. These movements disrupt the surface elevation pushing some regions down and pushing some regions up. In these fluctuations, the Kusasthali-Dvaraka island had already submerged twice before Krishna built his city there. The Rann of Kutch region too undergo submergence and re-emergence from the sea. During the life time of Krishna, Rann of Kutch was below see and Kusasthali-Dvaraka island was above the sea. Now in 2000 CE we see that Dvaraka in submerged state and Rann of Kutch above sea. By looking at the maps it is clear that Kumari Kandam was never in isolation with other submerged lands of India that extended along the western (Varuna plain) and eastern (Indra plain) coasts of India and that it encompassed Srilanka. All of these three submerged lands formed a continuum. This geographical contexts solves many mysteries that arose as one read the Sanskrit texts like the four Vedas, the two epics and the 18 Puranas along with the several ancient Tamil texts and makes a comparative analysis of all Tamil and Sanskrit texts. The fishermen tribes (skt. Matsyas, tamil. Meenavars), the snake worshiping Naga tribes, the great architect tribes called the Mayas, the Rakshasas in which Ravana belonged and the Yakshas in which Vaishravana Kubera all were inhabitants of Kumari Kandam and the contiguous lands extending from Kumari Kandam along Indian sea shore up to Dvaraka (Gujarat) in the west and Vanga (Bengal) in the east. Those specifically belonging to Kumari Kandam, were politically organized as the ancient Pandya kingdom. Pandyas were often called the descendants of Meenavars (Matsyas) and carried the fish symbol as their royal sign. Some of them migrated northwards when these lands submerged. Due to fear of submergence and as a natural reaction to it, they sought the highest mountains where they felt maximum safety. That is the reason why the Yakshas and Rakshasas always sought high mountains. One of their later base was around Kailasa mountain in the Himalayas in Tibet. During Ramayana period (life time of Rama, 5112 BCE) the Yakshas and Rakshasas lived in the high mountains of Lanka (Trikuda / Adam's peak) and in the high mountains of Kerala. During Mahabharata period (life time of Krishna, 3150 BCE) the Yakshas and Rakshasas predominantly lived around Kailasa under their king who used the title 'Kubera' (the rich) as they always do. Ghatotkacha, a prominent hero of Kurukshetra war was a Himalayan Rakshasa. Some Yakshas and Rakshasas continued to live in Lanka. Now the Yaksha tribes known as Yaks, Yashas and Yakkhas are found in Srilanka in the south and also in the Himalayas (Tibet & Nepal) of the north. A portion of Nagas who lived in Kumari Kandam (and in other connected submerged lands) too went northwards and lived in the Himalays fearing submergence. An example is Naga Nahusha one of the founding forefathers of the famous Aila-Puru-Bharata-Kuru lineage mentioned predominantly the Vedas and the Mahabharata. Nahusha's grandfather Pururavas was born in Himalayas where Ganga emerges from the mountains, as per Mahabharata. The fishermen tribes continued as the royal tribes of Meenavars in the south and as the Matsyas in the north along Sarasvati river. Pandavas stayed in one such Matsya kingdom ruled by king Virata during their incognito life. Vyasa's mother Satyavati too belonged to this Matsya tribe. The seven sages (Saptarshis) appear in the attire of Matsyas (fishermen) in Sumerian myths as founders of the Sumerian civilization. It is possible that the Saptarshis (seven sages, which sometimes include Vasistha and Agastya) belonged to the ancient Matsya tribe who inhabited in these submerged lands including Kumari Kandam. The Matsya who informed Dravida king Manu about the flood, asking him to go to Himalayas could be a learned Matsya from this submerged region. This Matsya is also hailed as the first incarnation of Vishnu in the Puranas. The Mayas of Kumari Kandam spread to north along with other tribes, as attested by a certain Maya who built an assembly hall for the Pandavas of Mahabharata fame at Indraprastha (Delhi). Using the maritime skill of the Paandyas of Kumari Kandam they have reached as far as Meso America. For reading about the migration of Mayas from India to Meso America as Maayans see the article:- danava-maya-and-mayans-of-america. River Narmada flowed through the northern parts of the western plain (Varuna plain) that submerged along with Kumari Kandam in the south and with the eastern plain (Indra plain) in the east of India. The river reached the sea after flowing through the Varuna plain. At one time (14,000 BCE and before) around 30% of Narmada's course lied in this fertile Varuna plain, making it a major river that flowed through the now submerged Varuna plain. Other rivers that watered this plain were Sarasvati and Sindhu. This submerged portions of Narmada river is mentioned in Mahabharata as the 'celestial river Narmada' i.e. the river Narmada flowing through the land of the Devas. River Sarasvati too is mentioned as flowing through the Deva territories, a name which applies to its northern course in Tibet where it rose from lake Manasa (Manasarovar Lake) and also to its southern course through the submerged Varuna plain. Mahabharata mentions that sage Visravas lived on the banks of Narmada (in a spot which is now submerged) and beget Yaksha king Vaishravana there, who was a step brother of Ravana begotten by Visravas on another women. The land of the Devas was known as Naaka Loka, which was also the land of the Nagas, the Naagaa Loka. It is possible that both are same and synonymous with Kumari Kandam and the connected lands of Indian shores. Thus, the Naga tribe seems to be an ancestral tribe which diversified into Adityas (Devas), Daityas (Asuras) & Danavas (Asuras) in one branching and into Aila-Puru-Bharata-Kuru lineage in another branching. The remaining Naga line then got diversified into Airavatas, Pannagas, Uragas etc. The Puranas often describe the Deva territory as divided among Varuna, Indra, Yama and Kubera. Varuna ruled the west, Indra the east, Yama the south and Kubera the north. This division is applicable in Kumari Kandam (and the connected coastal lands of India) during the end of Last Ice age with Yama ruling its southern portion, Varuna ruling its west, Indra ruling its east and Kubera ruling its north, including Lanka. Kumari Kandam submerged from the south, killing many inhabitants in several events of floods, thus a line of death gradually moving from south to north. This could be the reason why Yama, the ruler of south is described as the lord of death. When the inhabitants of the submerged lands moved northward and populated whole of India, then too the four fold division held roughly. Kubera ruled from Kailasa in the North; Yama ruled at what later became Indraprastha, on the banks of Yamuna (a name associated with Yama). Varuna and Varuna worshipers moved to west of India into Iran and further west. Indra and Indra worshipers moved to east of India to China, South East Asia and Japan. On their migration from the submerging lands, the Yakshas lived in Ila region (Haryana) before reaching the Himalayas, attested by the name Ailavila used to describe Yaksha king Kubera. Ila region was a major settlement of all the tribes who survived the floods in the submerging sea shore lands and moved northwards to the Himalayas and Tibetan highlands. Thus this land was called a holy land Ilaspada, where Devas and Asuras once lived. Ila in Tamil means the younger (younger sister), an epithet applied to goddess Lakshmi mentioned in the Sanskrit Puranas. Her elder sister is named Jyeshta. The Puranic goddess Lakshmi and the Rigvedic goddess Ila are same. Both in Tamil and Sanskrit tradition the younger sister Ila is considered as auspicious and her elder sister (tamil. Chetta, skt. Jyeshta) is considered inauspicious. Ila is also the mother of Pururavas. Thus Ila was the mother of the Aila-Puru-Bharatha-Kuru dynasty of Vedic and epic fame. Inter-plate deformations and Indian Plate - Kumari Kandam region was subjected to Inter-plate deformation. It lies in Central Indian Ridge (CIR) - Sumatra Diffuse Boundary. It is a region with anomalous seismic activity (Chagos Anomalous Seismicity Region).